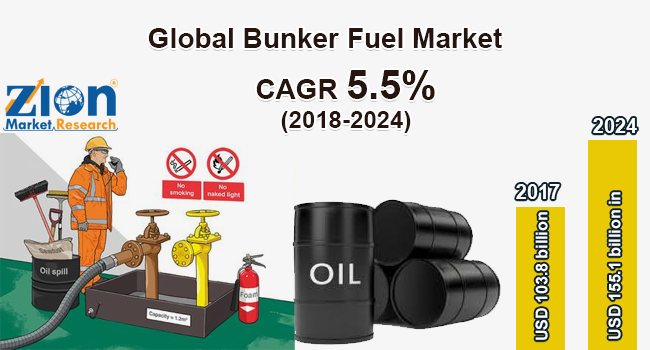 With the presence of a large pool of participants, the Global bunker fuel market is displaying a highly competitive business landscape, finds a new research report by Zion Market Research (ZMR). World Fuel Services Corporation, Aegean Marine Petroleum Network, Inc., Bomin Bunker Oil Corp, BP PLC, Bunker Holding A/S, Exxon Mobil Corporation, and Royal Dutch Shell Plc are some of the key vendors of bunker fuel across the world. These players are focusing aggressively on innovation, as well as on including advanced technologies in their existing products. Over the coming years, they are also expected to take up partnerships and mergers and acquisitions as their key strategy for business development, states the bunker fuel market study. Citing an instance, in August 2018, AP Moller-Maersk Group—a key player across transport, energy, and logistics sector—decided to manufacture its own blend of bunker fuel at Rotterdam through compliance with the international maritime organization‘s lower marine fuels sulfur cap in 2020. In a major boost to bunker fuel market in Japan, in September 2018, reports cite that the mounting bunker fuel costs at Japanese ports have not impacted the growing product demand from the customers. As estimated in this report, the global bunker fuel market stood at US$ 103.8 billion in 2017. Witnessing a tremendous rise during the period from 2018 to 2024, the revenue in this bunker fuel market is expected to reach US$ 155.1 billion by the end of the forecast period. The main types available in this bunker fuel market are Bunker A, Bunker B, and Bunker C.
“Thriving tourism sector supported by changing demographics along with rise in the disposable income and enhanced living standards are likely to contribute substantially towards marine passenger transport activities, thereby driving bunker fuel market trends,” says the author of this study. Apart from this, rise in the number of offshore exploration activities is likely to create lucrative demand for bunker fuel market in the years to come. In addition, many of the bunker fuel suppliers have shifted their business operations to offshore destinations and ports in vicinity of offshore hydrocarbon resource sites, owing to substantial demand for their bunker fuels. Regionally, Asia Pacific has been leading the worldwide bunker fuel market and is anticipated to continue on the dominant position in the years to come, states the bunker fuel market study. Increase in maritime transport activities witnessed in Asian countries such as China, India, and Indonesia is the main factor behind the dominance of the Asia Pacific bunker fuel market. The high number of market players being headquartered in Asia Pacific is another significant factor that is supporting the growth of this regional bunker fuel market.